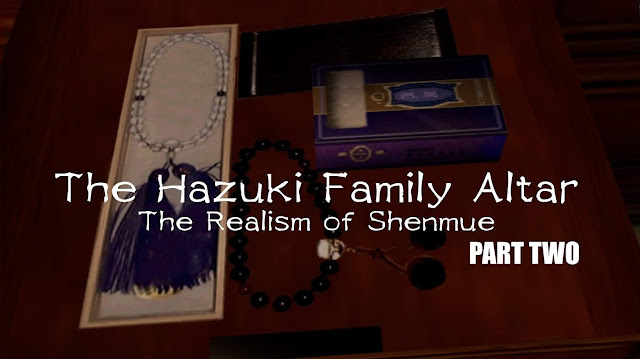 In this second part we wrap up our examination of the Hazuki Family Altar, this time investigating each of the individual items that decorate the altar and lie in the drawers. To start from Part One, click here. 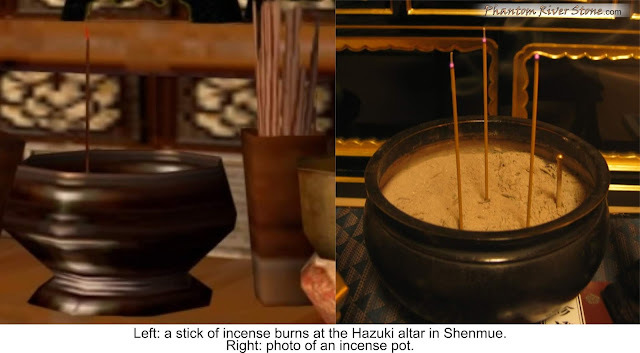 The Hazuki altar in Shenmue has been created with amazing detail, accurately reflecting many of the typical religious items to be found. Here are some brief notes on a few of these. Occupying the central upper position can be seen the religious icon. 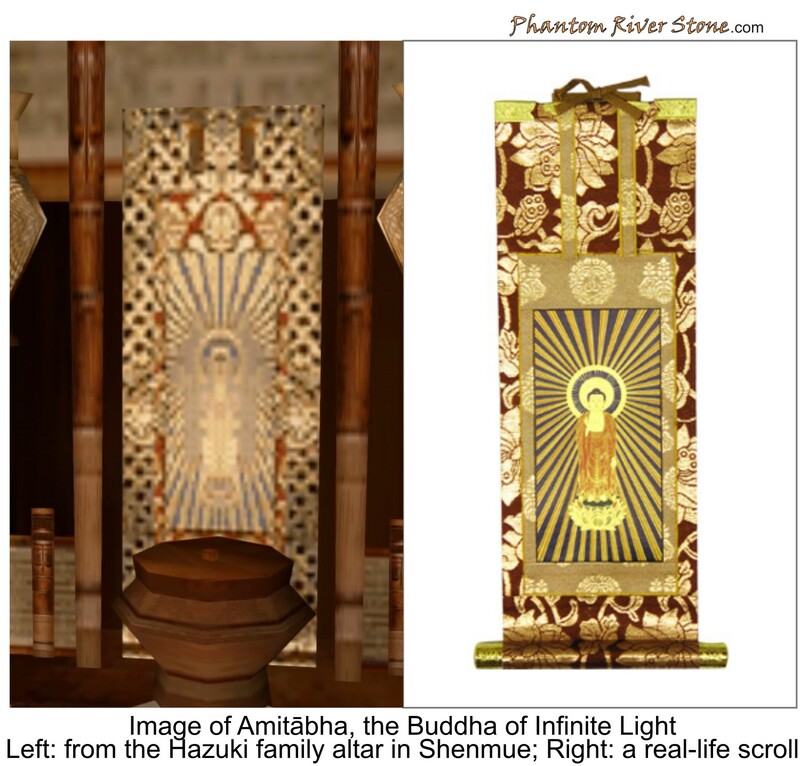 In the Hazuki's altar, it is an image of Amitābha, the Buddha of Infinite Light. On a lower shelf are two memorial tablets, engraved with writing. Memorial tablets are associated with the spirits of the deceased, and the writing represents the deceased's posthumous name, using specially-chosen characters. 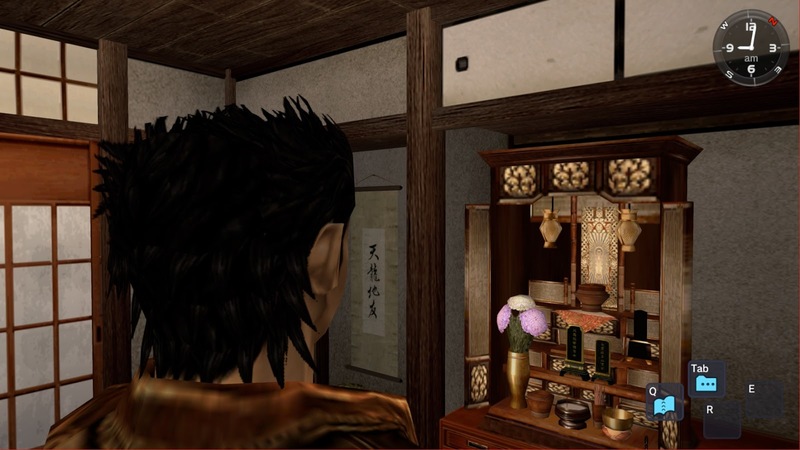 In the Hazuki altar, two memorial tablets can be seen, side by side. The one of the left bears the kanji character for "father" at the top, identifying it as being that of Iwao. How about the one next to it? It has the the kanji character for "mother"; it is Iwao's wife, who died many years ago when Ryo was a young child. This is a neat detail that may not be obvious when playing the game. 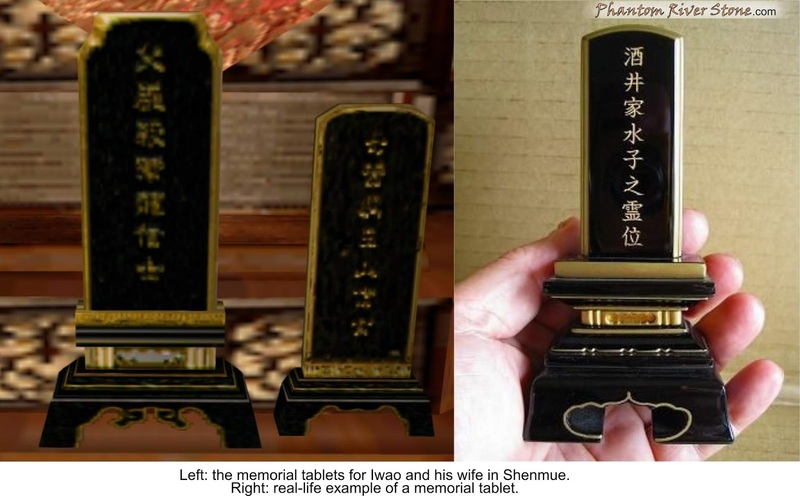 The remaining kanji characters on the tablets represent the individual's posthumous Buddhist name (kaimyou) that is conferred upon each of the deceased. The tablets can be made from a range of different materials. Based on their appearance, the ones at the Hazuki residence may be made of lacquered wood. Notice that the tablets are of different sizes. This is because, in the past, it was common for the tablet of the master of the house to be of a larger size than that of his wife's (however this is no longer the case these days). 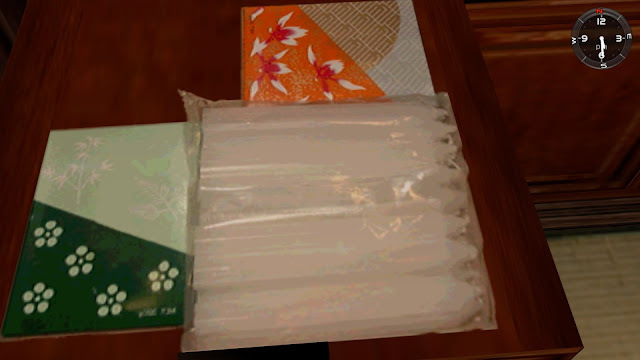 A holder of fresh incense sticks can also be seen standing nearby. 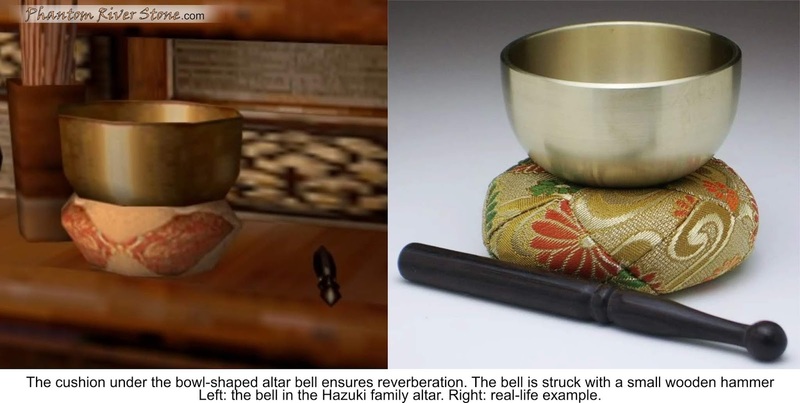 The bell resembles a metal bowl that sits on a cushion so that when struck, the note is sustained and does not die away immediately. Being Shenmue, not only has the altar been faithfully recreated, but the contents of the drawers underneath it also hold an array of believable items. Since Iwao Hazuki passed away recently, it is likely that these represent left-over "return gifts." 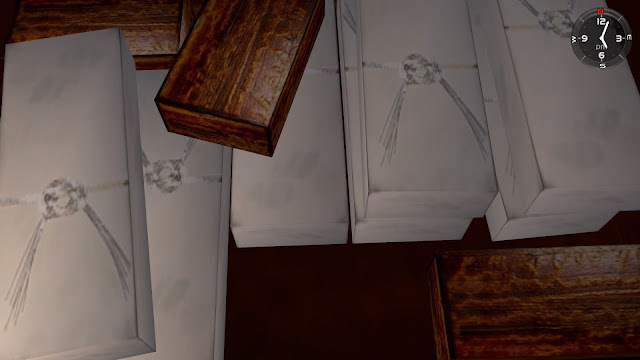 As background, it is customary in Japan for guests at a funeral to give a gift of money to help cover costs, and in return each receives a small item (such as a boxed food item). There are strict rules about the way the cord is tied around the gifts - including which way the ends point, according to the type of event (funeral, wedding and so on). 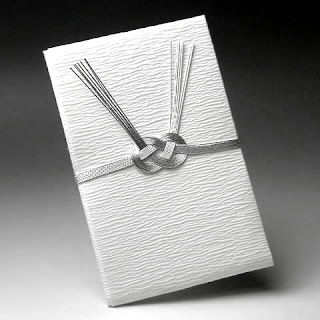 A specially-wrapped envelope used for giving a gift of money at a funeral. As Iwao Hazuki is obviously a respected and well-known member of the community, many such "return gifts" would have been purchased and wrapped in advance, and conceivably several may have been left over, explaining their presence here. Along with the wrapped ones are a few plain wooden boxes. We may conjecture that these boxes are the gifts themselves, in unwrapped form - although their actual contents are up to our imagination. 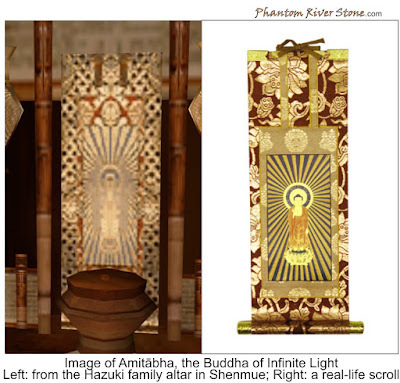 The representation of the family altar is another example of the incredible detail and depth in Shenmue. It adds to the story by demonstrating the respect characters have for members of their family and each other in their daily lives, as well as giving players insight into the role Buddhism can play in many Japanese households.